In light of an aging aerospace workforce, do you have a plan for supplementing the knowledge that will disappear with your retirees? How do you plan to arm the next generation with the tribal knowledge that your existing talent possesses? “A highly skilled and robust aerospace workforce is essential to our national security and economic prosperity. Yet today the industry faces impending retirements and a shortage of trained technical graduates, which is a situation that is forecasted to worsen within the decade. Some companies address this issue by outsourcing work around the globe. In aerospace and defense, however, security requirements dictate that most design work on military systems must be done by U.S. citizens. Thus the need for U.S. developed technical talent is particularly acute to ensure a world-class aerospace workforce ready to lead in a global economy. With arguably some of the world’s most complex product development programs, aerospace IPTs (Integrated Product Teams) benefit from a team approach in development of the aircraft having tribal/elder knowledge built in. As this expertise disappears, there needs to be a strategy in place for capturing that knowledge to leverage among the next generation engineers. As AIA expresses above, today’s design engineers just do not have the manufacturing knowledge that their predecessors had. Lack of manufacturing knowledge and/or lack of visibility to manufacturing processes can lead to non-manufacturable designs, designs that run way over on cost, and Engineering Change Orders (ECOs), which can be extremely costly AND can result in program delays. Further, addressing issues late in the design phase or during production has an added layer of complexity due to certification processes. With increasing global competitive pressure, companies must innovate using the latest materials and manufacturing processes, yet do so while minimizing their risk due to uncertainties and ensuring profitability. As a result of focusing on performance and schedule, visibility to cost and manufacturability within the design community was limited. To remain competitive, aircraft manufacturers must instill this knowledge within the design teams as opposed to relying on the specialists who are gradually moving on. So while the government does what it can to remedy this problem, what can aerospace companies do to create solutions to this talent crisis both short term and long term? And how can today’s engineers avoid design mistakes and identify cost issues before releasing to manufacturing? 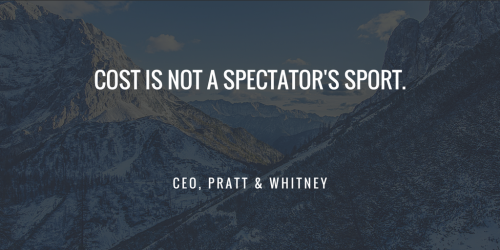 When manufacturability, cost visibility and cost awareness are instituted as primary goals for a company’s product development programs, responsibility and visibility of cost is expected during the earliest stages of development, resulting in fewer ECOs down the line. Creating a cultural shift needs to be an enterprise-wide philosophy and senior management buy-in is critical to its success. Arm your design community with the ability to understand cost drivers in their designs, quickly evaluate alternative designs, and identify features that drive manufacturing complexity. Some companies are using aPriori to change the culture and to provide some training without overwhelming design engineers. Designers gain visibility into manufacturing routings and receive real time feedback on cost and manufacturability as they iterate on their designs. Gradually, designers can build their own expertise by leveraging the tribal knowledge of the specialists that has been digitally embedded into their CAD-Integrated cost and manufacturing guidance system. So as your talented engineers prepare for the next stage in their lives, know that there are strategies and solutions for maintaining their expertise and knowledge within your organization for the next generation. 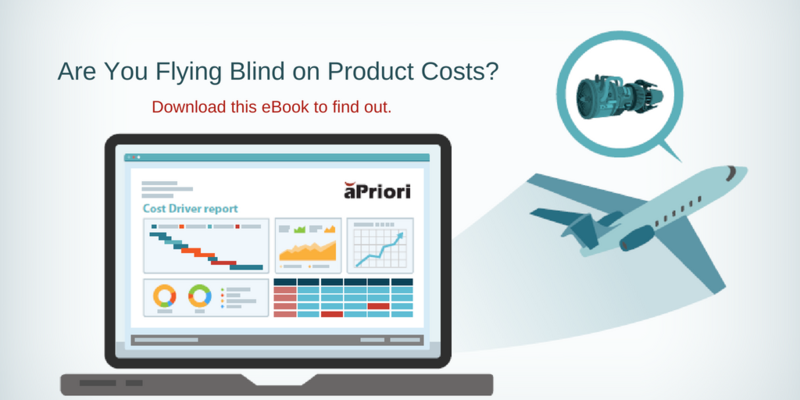 For additional resources on topics like this, check out our eBook, “Are You Flying Blind on Product Cost” by clicking the image below.